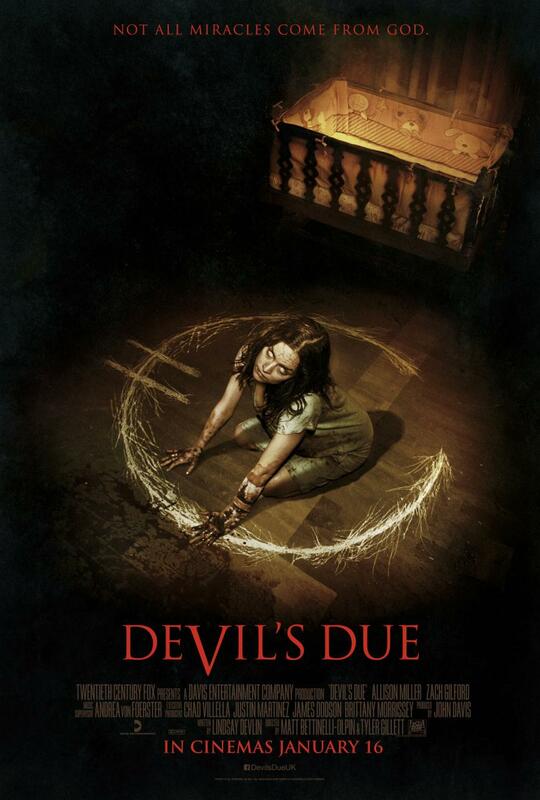 Devil’s Due, brought to us by the directing team of Matt Bettinelli-Olpin and Tyler Gillett is the story of newlywed couple Samantha and Zach McCall. Zach has proclaimed his intention to videotape their lives from the day of their wedding and onward. So, it’s a found footage movie. You are most likely familiar with this directing team’s work from V/H/S; their segment was titled “10/31/98″ and it was a pretty effective little nugget of haunted house/ satanic ritual malarkey. Unfortunately, the similarity between their two projects kind of makes the former feel like the practice run for the latter. As with any found footage movie, the reasons for the myriad number of camera angles available are a bit flimsy. This couple is, conveniently, being watched by a mysterious group of people. So, between the hidden cameras in their house and Zach’s insistence to videotape everything and I mean EVERYTHING, we are gifted with watching Samantha’s pregnancy progress. A”honeymoon baby”, Samantha isn’t especially excited about the pregnancy, but Zach is, so she puts on her brave face and plays along. There is a moment of brutal honesty later in the film when Samantha says how she really feels about the pregnancy; I found this to be one of the very few very real moments in the movie. Zach and Samantha are a very likable couple, which is good, but they’re almost too perfect. Why do young couples in found footage movies always have huge houses, decorated impeccably, and no one seems to work? How do I get in on this lifestyle? I’m not going to utter the name of the movie that clearly influenced Devi’s Due, but suffice to say, there are no fierce Vidal Sassoon haircuts in this movie. I want to love Devil’s Due because everything about it is good. The story is good. The actors, Allison Miller and Zach Gilford, are wonderfully likable and believable. Gilford (Friday Night Lights) is his usual charming self and you can’t help but root for him. The story behind the pregnancy is, actually, quite believable. Perhaps I’m overly paranoid, but I can totally see this scenario playing out for many couples on vacation. Unfortunately, I sat in the theatre feeling very “been there, done that”. Worse than disliking or loving the movie, I felt apathetic. The jump scares could be seen a mile away and it all just felt too familiar. It’s a solid movie and if you’re a fan of found footage, I highly recommend spending 89 minutes with the lovely McCall couple. I fear that this girl has simply seen too many found footage movies. Had I experienced this a few years ago, I believe I would have really loved it, but by the time they set up for the inevitable sequel, I just felt exasperated by the whole experience.